Sewing machines, which are celebrated today, are used to stitch material like cloth or leather. They are usually powered by electricity, but many are still powered by a treadle, just as many early machines were. Their basic design has remained over the years, consisting of a needle, and a shuttle to carry thread. First being used in factories, they were a symbol of the industrial revolution, marking the shift from handmade to automated production. They also became important for home use. Women once spent much time sewing by hand, and the invention of the sewing machine helped free up a lot of this time. Thomas Saint of England took out the first patent for a complete sewing machine. He was given patent #1764 in 1790. Some sources say that he received his patent on June 13, explaining why Sewing Machine Day takes when it does. The machine was to have an awl that punched a hole, and then a needle that would go through the hole. It is unknown if Saint created a prototype of his sewing machine, and only the drawings of it survive. Over the next forty years, various sewing machines were created, all without much success. Then, in 1830, Barthelemy Thimonnier, a French tailor, created a functioning sewing machine. However, French tailors burnt down his garment factory because they thought his invention would drive them out of work. 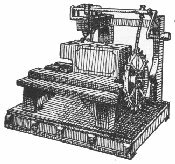 In 1834, Walter Hunt built the first somewhat-functional sewing machine in America, although he did not get a patent. Elias Howe adapted Hunt's style in 1846 and became the first to patent a sewing machine in America. His machine had a curved needle with an eye at the point. After going through the cloth, a loop was made with the thread, and a second thread went through the loop and interlocked with it. This created what became known as the lockstitch. The first commercially successful sewing machine went into production in the 1850s. Built by Isaac Singer, it was the first to have an up-and-down motion mechanism and the first to be powered by a foot treadle instead of a hand crank. But, it did use the lockstitch that Elias Howe had patented. Although Howe had gotten the lockstitch idea from Walter Hunt, Howe sued Singer for copying his patent and won. By 1860, there were more than 110,000 sewing machines being created per year in the United States. During the late nineteenth century, various other types of sewing machines were invented, such as the chain-stitch single-thread sewing machine, and the zig-zag stitch machine. Sewing machines were first used in garment factories, but in 1889, the first sewing machine for home use was made and marketed. By the early twentieth century, electric-powered sewing machines came into wide use. Sewing machines were found in most homes for decades, where they were seen as necessities. They are not as integral to home life as they once were, but are still used to make clothes in factories. If it was not for the invention of the sewing machine, it would be much more difficult to make clothing, as it would still need to be made by hand. This seems to be a pretty good reason to celebrate the machines! Sewing Machine Day is observed next on Thursday, June 13th, 2019. It has always been observed annually on June 13th. Celebrate the day by taking out your sewing machine and doing some sewing. Create a new piece of clothing, or fix up an old piece. Sew alone, or sew with friends. Perhaps you first need to buy a sewing machine or repair your old one. If you are a novice sewer, it may be be a good idea to sign up for a sewing class.